Ashton Wolf, Manny Questel and Domingo Questel. The finals of the 2011 United States Arena Championship were held at the California Polo Club in Los Angeles, CA. The tournament featured teams led by 7-goaler Billy Sheldon and 6-goaler Domingo Questel. This year, however, it was the father-son combination of Domingo and Manny Questel who took home the silver for the California Polo Club on the strength of a nail-biting 11-10 contest that was in question until the final seconds of the last chukker. This year it was neither Billy Sheldon nor Domingo Questel that put up the big numbers as Manny Questal scored nine times in the championship event. California Polo Club struck first with a goal from Manny Questel, but Thomson-Reuters answered with a pair of goals from Manny Rodriguez. Manny Questel closed out the first chukker scoring with his second goal on the day for a 2-2 tie. “It was an incredibly physical game,” said actor Grainger Hines, who was part of a standing only crowd that included USPA Circuit Governor Denny Geiler, producer Michael Butler and actress Stephanie Powers. Manny Questel evened the score at 5-5 to end the first half. Number 1 position, his sole job was to cover Billy (Sheldon),” he added. responded. A goal from Rodriguez and a penalty goal knotted it up again at 7-7, but California Polo Club’s Manny Questel scored the go-ahead goal to end the chukker leading Thomson-Reuters by a narrow 8-7 edge. Cary Burch’s first goal of the game for Thomson-Reuters leveled the score at 8-8 for the fifth tie of the game in the early going of the final period of the game, but scores from Wolf and Manny Questel gave the California Polo Club a two goal, 10-8 lead. Burch cut the lead to a single goal, 10-9, with his second goal of the chukker, and another goal from Sheldon had it deadlocked at 10-10 with less than two minutes left to play. Sheldon’s third goal of the game had the score at 10-10 with time running out. A penalty against Thomson-Reuters put Manny Questel at the line. “I hit the ball to the right on the penalty shot and then buried it into the goal from midfield,” said Manny Questel. 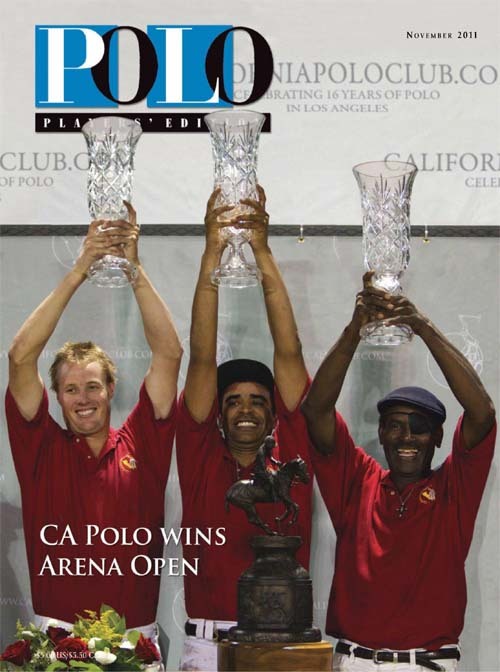 Initially scored as a two-point shot, Referee Vicky Owens overruled the call, leaving the California Polo Club in front by a single goal with 1:20 left in regulation time. “It was the longest 80 seconds of my life,” said Manny Questel after the match, and well it should have been. 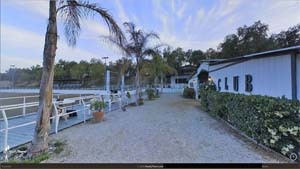 With less than ten seconds on the clock Sheldon broke loose toward the California Polo Club goal only to be thwarted by a heady defensive effort from Wolf. Time expired with the California Polo Club celebrating the 11-10 victory. Manny Questel received MVP honors for his explosive offensive impact on the game while Albert, owned by Poway Interscholastic Polo and played by Billy Sheldon was honored as Best Playing Pony. In earlier action the Gladiators team of David Oles, Kerstie Allen and Ernie Darquea scored a one-sided 14-8 win over the struggling Urban Dog trio of Kim Garsed, Megan Judge and Gabby Questel. The Gladiators charged out into the arena and put up seven unanswered goals in the opening chukker, sending a shell-shocked Urban Dog team out of the arena after the first chukker in a 7-0 hole. It was 14-6 after three chukkers with Darquea scoring at will for the Gladiators. Urban Dog managed two more goals in the final period while Darquea scored his thirteenth and fourteenth goals of the match. Oles chipped in his second score as the Gladiators rode off with the 14-8 win. To no one’s surprise, Darquea was named MVP while Megan Judge’s Cartagena received Best Playing Pony Honors.